Eons ago, your ancestors searched the black void of space for intelligent life. Their search proved fruitless. They were alone. Desolate, they used their technology to send the seeds of life to inhabitable planets across the galaxies. Over millions of years, the alien species evolved, but before the ancestors could see the fruits of their labor, they disappeared. To aid their children, your ancestors left behind a legacy of advanced technology and hyperspace gates- gifts to encourage communication and harmony between their children. But without the guide of an elder, you and your distant alien cousins must learn to communicate, negotiate, and coexist. Welcome to the Cosmic Age. The open skies of countless worlds are filled with speeding spaceships, and a panoply of alien species compete to populate the galaxy. Will your people choose to occupy undefended worlds, create peaceful civilizations, or ruthlessly conquer foreign planets? In the quest to colonize the vast cosmos, there are as many paths to victory as there are aliens seeking it. Peace, war, negotiation, betrayal—you never know what will happen in the next encounter! 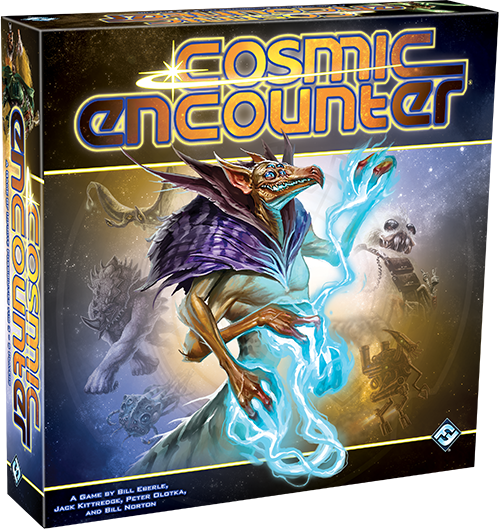 Cosmic Encounter is a game of interplanetary colonization and cunning negotiations in which three to five players become the leaders unique alien species seeking to colonize as many planets as possible away from your native system. The first leader to colonize five planets in other species’ systems wins. Of course, every planet is ruled by someone and even planets that are not colonized are still defended. In order to establish a settlement, you’ll need to win over the planet’s ruler, either through negotiation, partnership, or war. This fast-paced game of intergalactic colonization includes a diverse cast of fifty alien species, each with its own history and powers that shape your strategy and ensure that no two games are the same. You may be the leader of the genteel and thieving Filches, sensitive and oozing Amoebas, sneaky, infesting Parasites, or self-sacrificing Kamikazes. Your powers offer you a unique advantage over your rivals. They may enable you to quickly travel through space, prevent your defeated ships from falling into the Warp, or allow you to look at another player's hand before deciding your next move. By using your natural talents to your advantage, you are sure to conquer the galaxy and ensure your species’ dominance! You begin with five home planets and twenty ships. To spread your civilization across the stars, you must send ship through the hyperspace gate opens before you. Destiny decides where you will attempt to establish a colony, whether it be in the system of a dire foe or long-term ally. Once you’ve launched your ships, you can then ask other players to support you, as can your opponent. But be careful! Even your allies are still enemy alien species with their own agendas. Will their participation help them to advance while you struggle, or are you cunning enough to use the alliance for your benefit? When all the ships have reached their destination, you pick what card you will play, deciding whether to fight, negotiate, or morph to mimic your opponent’s action. Alien powers and Reinforcement, Artifact, and Flare cards can also be played at this time. Finally, you and your opponent resolve the outcome. You may win and establish your colony, or you may be defeated and lose your ships to the Warp until you rescue them. Otherwise, in the chaos of conflict you may win a battle, but still lose ships or cards, or negotiation a more beneficial outcome for all parties, or have negotiations may fail utterly with dire consequences for both you and your opponent. If you succeed in establishing a new colony, you move closer to victory, but you fail, your ships are sent into the abyss! 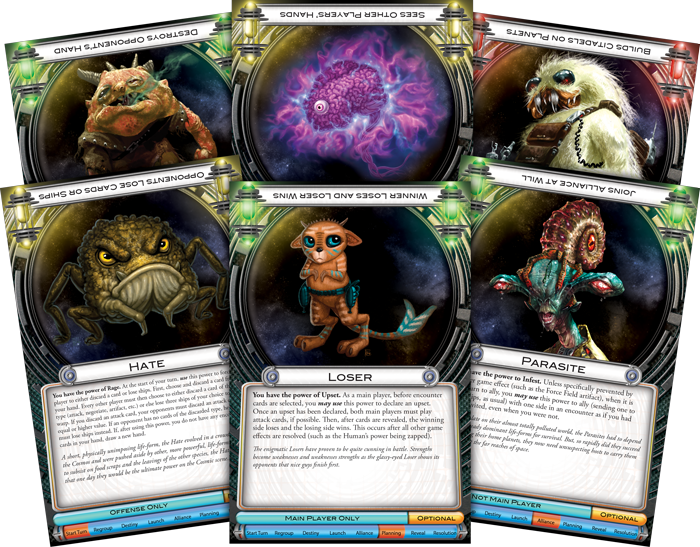 Cosmic Encounter offers you and your fellow aliens several variants for gameplay. You may choose to shorten of lengthen a game by altering the number of colonies required or integrate Tech cards to give each player a specific objective. By researching these wonderous tools, Tech cards become useful assets that add a new layer of strategy and chaos to your games. 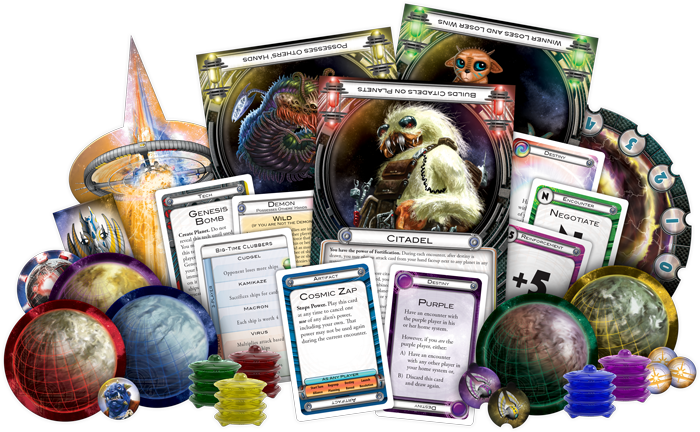 With its numerous alien species, Flare cards, Artifact cards, and gameplay variants, Cosmic Encounter truly offers infinite gaming experiences. 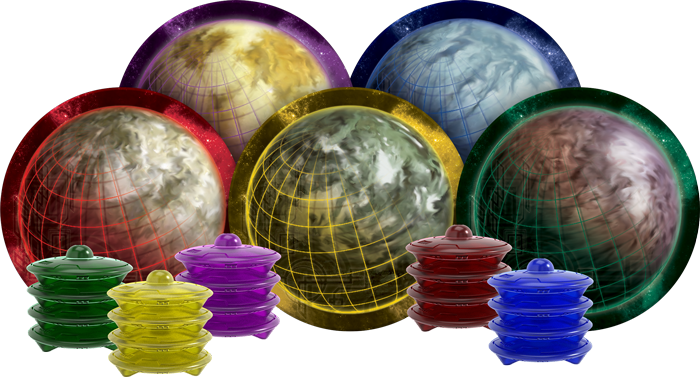 With an easy-to-learn base for newer players and a variety of customization and strategic complexity, Cosmic Encounter is sure to engross any player in the cosmos. So now the time has come- amass your fleet, form your alliances, and dive into the vast galaxy! The copyrightable portions of Cosmic Encounter are © 2018 Fantasy Flight Publishing, Inc. Cosmic Encounter is a registered trademark of Eon Products, Inc. Used under license from Eon Products, Inc. Fantasy Flight Supply is a trademark of Fantasy Flight Publishing, Inc. All rights reserved.